This started as a project to colour while I was looking after a grandson the other day, and to also enter it in the Daily Marker Challenge. I often do the colouring, but don't always get the projects finished.! 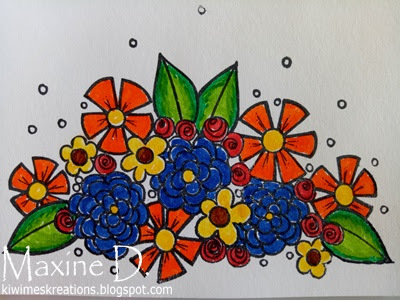 I coloured the image (Flower Swag 3 by Tammy Tutterow) using crayola markers - they are new, and very juicy - so much so that when I added the second green to the leaves, it re-activated the first and blended it - the flowers were also very bright. I dabbed the blue as I coloured, it was so dark. I still was not that happy with it, so next day I tried spritzing a dried sample, liked the results, so held my breath and spritzed the image, dabbed with a paper towel, repeated, and was really happy with the result!! The end was still fairly bright, but somewhat muted and 'softer' in appearance. What is not visible here is that there is a wee bit of a 'watercoloured' look to it, and the brush strokes are now blended in. 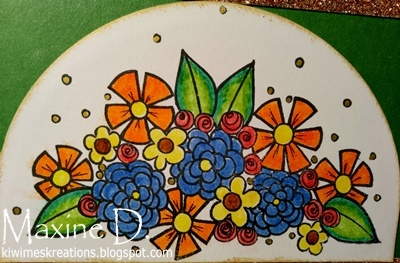 I cut the image panel into an elongated semicircle, and sponged it with Delicata Golden Glitz ink to tie in with the tiny dots that I coloured with a Signo Gold Pen. I die cut the letters for the greeting from a Couture Creations set from the same glitter cardstock and added the Spellbinders Border-abilities decorative one at the base of the card. I decorated the base of the inside with the same border die cut that I used on the outside - again thanks to the sparkle it is not a clear photo. Unfortunately I didn't realise the last photos were so blurred - blame the glitter card. The card has now been posted so I cannot re-do the photos. What a happy card Maxine! I love the glitter! Have a good new week! What a nice Birthday card!!!! Thanks so much for joining us at Corrosive Challenge blog!!! Always love a bit of glitter Maxine and add some flowers and it creates perfect in my book. Beautiful card, Maxine. I love the green-gold colours, the glitter effect and the lace! Kisses, my friend. I love primary colors! This is so sweet, Maxine. Just a quick word about your new blog design, I absolutely love it! It's very clean and streamline. Makes everything easier to read and enjoy! Your new banner is beautiful!!! Great save again Maxine love you show both side, before and after, and think it made a great card. All that glitter looks so fun with that boldly colored design. You certainly fixed it up but spritzing it. It was too dark otherwise. What a lovely card this is. I never thought of spritzing to take some colour off - maybe I will also try muting this way and with a babywipe, am sure the latter should work as well. I do loke the colours you chose. Such a gorgeous bouquet! Lovely card! Very pretty! Beautiful image and I love all the sparkle! Thanks for playing with Jo's Scrap Shack. Beautiful - and I like bright colours so I liked both! Thanks for sharing this crafty thing with us at Crafting with Dragonflies. A beautiful card. I love the image and the bright colors. Lovely card. Thank you for joining the challenge at Crafting with Dragonflies and Fun Day Friday. Hope to see you again next time.